By Sylvia Jay, Professional CAPPDT member, Dog Behavior Expert, Columnist, Author of "Dump Dog — Transformation Of A Feral Dog"
I would have given a year's earnings to be able to enter my Aussie Davie's mind when she charged into a group of tired, organized and calm sheep, stirred them up, just so that she could round them up again. Sheep-folk call the act of causing disarray for the purpose of re-organizing Aussie Bowling, because it is typical of the little sharp, fun-loving, and easily bored herding dog. 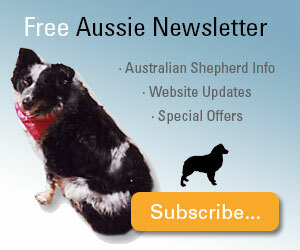 Australian Shepherds are bred since centuries to bring order into chaos. That personality trait is so ingrained that they find ways to create chaos in order to work. Hence, the clever Aussie has a reputation for being determined, bossy, and active. And for that reason many owners believe they have to be bossier, more controlling and more determined to keep the pooch in line. 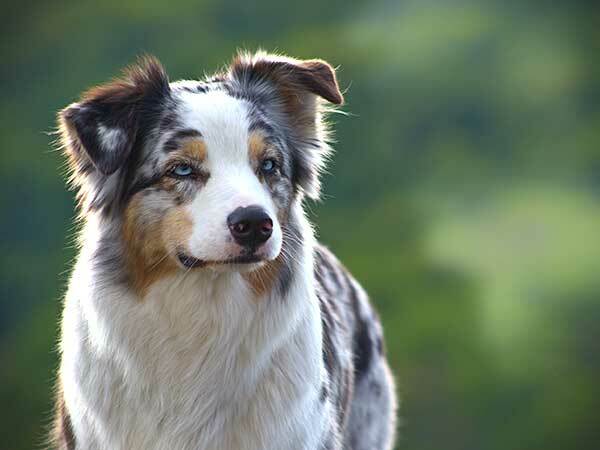 The problem is that unless the owner is born CEO material, the persistent and stoic Australian Shepherd will struggle back. What could be a relationship of mutual respect and voluntary co-operation, is one that is overshadowed with confrontation and a whole array of behavior problems. 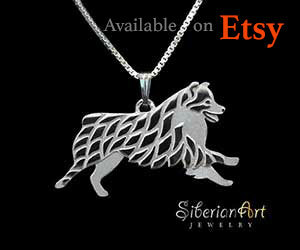 An Australian Shepherd's favorite pastime. Your Aussie is "plugged in" from the moment you invite her into your social group and remains alert, attentive and energetic for many years. 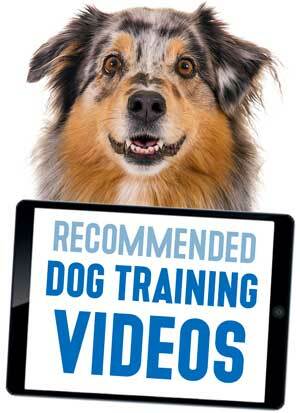 Chronological age doesn't mean much to your pooch. You have to put her to work right away and don't hope for retirement any time soon. Many owners are aware of that, but many also believe that physical activity is enough. It's not. Quite the contrary, too much physical activity often leads to a permanent high and your Aussie becomes hyper and overly vocal. You have to work his mind and body, and because he is a herder, herding activities leave him mentally and physically satisfied the most. If there are several family members in your pack, teach your Aussie to round them all up first thing in the morning, and several times throughout the day. Make it her job to wake them, and let her usher them to the breakfast table. On walks, spread out on purpose and give your dog the joy to group everyone back together. Make sure she waits until you command her to. That part is critical, because you want to be in control of her drive, her instincts. If you don't have family members, name her toys and teach her to bring each one, or to return it to the toy box. Spread her stuff everywhere and teach her to bring it back, or to place it all on a mat in the middle of the room. On walks, ask her to find the car, or a glove you "accidentally" dropped. Have her work for food by hiding part of it or stuff it in a Kong; play ball and Frisbee but ask her in a down stay every so often and hide it, for her to find. 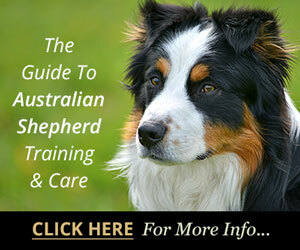 Obedience and tricks, are a wonderful way to channel an Aussie's energetic personality and keep her balanced. Because she is easily bored, spread her activities out, rather than having an allotted time set aside for training. Stay involved. Don't send her in the yard on her own, join her in scouting the property; take her to check the mail; ask her help to clean the cat litter box—a good time to practice the leave-it command when there is yummy cat-doo to be had. In other words, incorporate your Australian Shepherd in anything you do and be attentive then, command her to go to the mailbox, rather than have her trudge behind you. It doesn't take a lot of extra time but your dog will feel useful; will feel like a working partner. You have to have a command and hand signal to let your spirited Aussie know when you're done engaging with him. You'd be hard pressed to physically outdo your Australian. He is like the everlasting Energizer bunny. The "All-done" command tells him that work is over for now. Sweeten it by giving him a chewy, bone or stuffed Kong. That way you teach that "All-done" is a desirable command and doing nothing is rewarding. Be consistent with all your commands; follow through once you uttered a request. 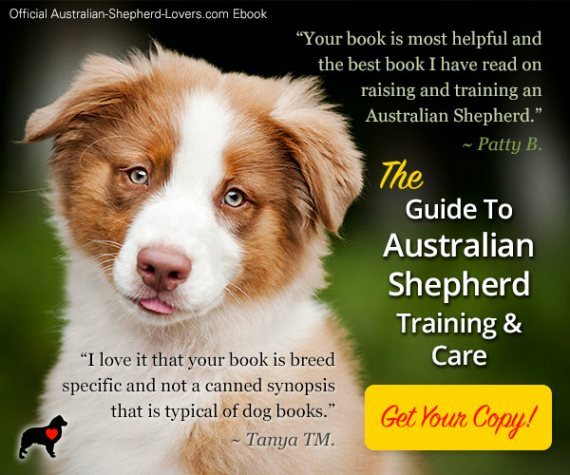 Consistency is important for all dogs and all commands, of course, but the "All-done" is especially crucial for the Aussie. If you throw the ball one more time after you off-switched your dog, you can be sure that he'll remember that. You only have to do a thing your Aussie likes once, for him to believe it's a new routine. Australian Shepherds are herders and as such very aware of space and space infractions. If you wonder why many space-clueless retrievers are clued in by herding dogs, it is because the herders rightfully know that being in someone's face is rude. That means that whenever your Aussie in encroaching into your space, she knows what she is doing. Don't let her. Control your space. 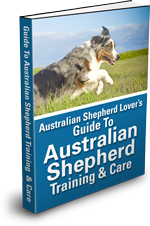 Because the Australian is also very perceptive of body movements, again more so than many other breeds, you best move her by walking into her, backing her up with your body, or blocking her way. If she's too close on the heels rounding your children up, or ushering your guests around, get in between your dog and the other person and back her off. Don't use any force, never confrontation, but be convincing; move strong, confident and with conviction. Your dog will learn space balance; to be respectful of a 30-50 cm personal space everyone is entitled to. That is the single best way to prevent heel-nipping. Put cuddling on the couch or bed on command. Space control doesn't mean you can't be close, but it means that it has to be invited. Your controlling Aussie might also see the need to be in charge of your home's entrance points, namely the doors. Teach her very early on that you control the space around the door, that you let your guests in and she needs to be a good 2-3 feet behind you. Don't allow guarding and don't let her bark out the window. Who exists and enters first when you go for walks is irrelevant. What is relevant is that she doesn't perceive the home as a space she has the right to control. Aussies are motion sensitive. They have a keen awareness of movement in their environment. And because they are herders, movement causes them to act, to charge up and redirect, or kill, if whatever moves doesn't belong into her perception of the world. Joggers, children, cats, a flock of birds, anything can be targeted. If she hasn't learned space balance and bite inhibition, this ingrained reaction to motion can get her and you into trouble. 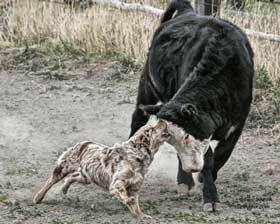 To be aware and proactively redirect are keys to successful off leash outings. Recall, leave-it and name attention to connect her back to you should be solid. An Aussie is not the kind of dog you can just take to the park and forget about. When she is bored, she'll create her own fun—if she focuses on the environment, she'll engage with the environment. Stay engaged with her, play ball, teach her to jump across logs or target sticks and leaves, play follow the leader and have her chase you, keeping that 30-50 cm personal space in mind, organize a playgroup with dogs that have similar play behaviors. She'll learn that you make fun and work happen; that the environment is irrelevant and boring. 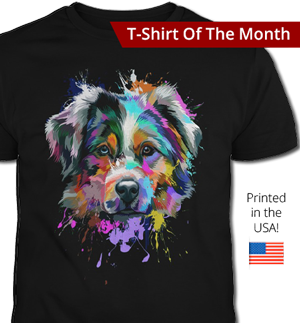 Your Australian Shepherd might naturally rule the other dogs (and cats) in your home as soon as she takes residence and regardless of age. Don't let her bully them, and don't let her be bullied by the other dogs to "teach her a lesson". Australians are persistent and he won't learn it, will instead redirect aggression. Instead, step in and, without taking sides, you guessed it, create space. 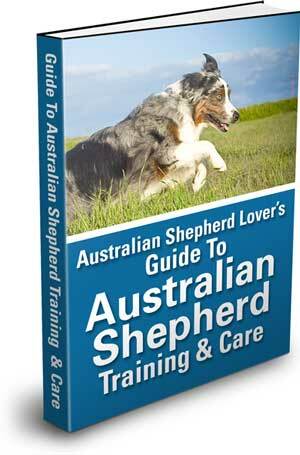 Your Aussie craves your attention and wants nothing more than to have social belonging and be a working partner. To be engaged with you should be her biggest reward, withholding attention her biggest punishment. Social isolation is abuse, but don't give her all the attention for free—reward her with it for desirable behavior and then be generous.